PIP arthroplasty to correct hammertoe. A curved plantar incision gives good access but avoids a scar under the metatarsal head. The neurovascular bundle is retracted. The flexor sheath is incised and the tendons retracted. 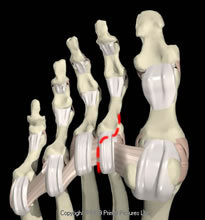 The MTP joint is plantarflexed to reduce the plantar plate tear. Small tears in good quality tissue can be sutured. Large tears with little distal tissue can be treated by reattachment of the proximal plate to one or two suture anchors in the base of the phalanx. Powless and Elze (2001) reported that eight patients (5 isolated plantar plate repairs, 3 plantar plate and collateral ligament repairs) were relieved of their instability and pain at review, but no more detail was reported on outcome. Gregg et al (2007) reported 35 procedures in 21 patients, all of whom had a Weil osteotomy as well as plantar plate repair from a dorsal approach. At an average of 26 months one toe had grade 2 instability, 9 grade 1 and 25 no instability. Five patients still had some pain. The average post-op AOFAS lesser ray score was 89 (no pre-op data available). There were 4 infections and one transfer lesion. Seventeen patients were satisfied with the result but the causes of dissatisfaction were not analysed. Bouche et al (2008) reported 15 patients who had PIPJ arthroplasty or arthrodesis and stabilisation with both plantar plate repair and flexor-extensor transfer. The mean AOFAS lesser toe score was 83. Four patients were only partially satisfied, with residual forefoot pain; they also had first ray hypermobility. Five patients' toes did not touch the floor. Overall these results are similar to those of flexor-extensor transfer and an RCT against flexor-extensor transfer would seem to be appropriate. Synovitis and irritabilitity with a partial thickness tear but little or no instability can be debrided arthroscopically - our early results in a few patients are good. However, even partial thickness tears can be associated with instability, presumably because of attrition and stretching of the remaining plate tissue. There is no data currently to tell whether these should be plicated or simply debrided. Most early series reported flexor-extensor transfer with about 2/3 painfree and 5-15% recurrent deformity. However, Myerson (2005) reported 1/3 of 59 patients dissatisfied because of a stiff, often painful toe after this procedure. Where a Weil procedure has been used to reduce a joint, the total rate of recurrent deformity summed across the published series is about 15%. About 40% of MTP joints are stiff after a Weil osteotomy, and floating toes have been reported in 20-60%, although these are often asymptomatic. Boyer et al (2004) avoided floating toes with a flexor-extensor transfer and MTP transfixion with a wire. All MTP joints were stiff in their series but patients were not dissatisfied - however, Myerson's larger series must also be considered.